Interstate 89 is a scenic highway serving the states of Vermont and New Hampshire. The freeway joins the capital cities of Montpelier and Concord as part of its northwestern route to Lake Champlain from southern New Hampshire. Continuing northward from Burlington, Interstate 89 transitions into Quebec Provincial Route 133, which leads north to Autoroute 35 for Montreal, Canada. Future construction will provide a seamless connection to Autoroute 35. Interstate 89 briefly parallels U.S. 4 as it crosses from New Hampshire into Vermont before turning northward along an independent alignment to Montpelier. U.S. 2 accompanies the freeway west from Montpelier to Burlington, where U.S. 7 ties in northward to Milton and the Lake Champlain Islands. U.S. 2 turns west to South Hero while U.S. 7 stays adjacent to I-89 to the Canadian border at Highgate Springs. 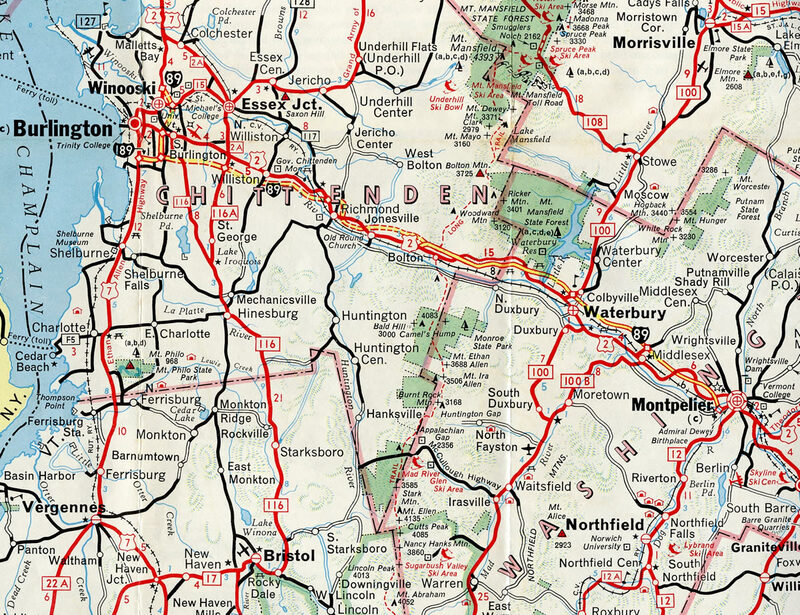 Interstate 89 between White River Junction and Montpelier, Vermont – 1966 Vermont Official Highway Map. The last stretch of Interstate 89 constructed ran south from Memorial Drive at Montpelier to the temporary end at Vermont 14 by West Hartford. 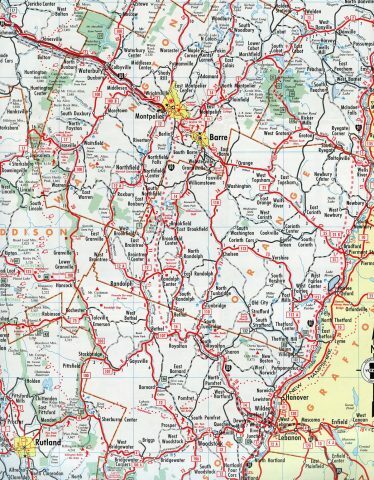 Interstate 89 between Burlington and Montpelier – 1963 Vermont Official Highway Map. 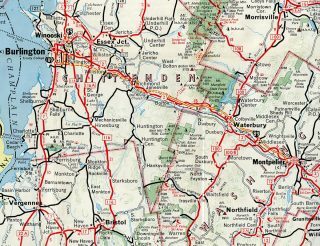 Interstate 89 was complete from a temporary end west of Bolton to Memorial Drive at Montpelier by 1963 and from I-189 to U.S. 2 (Main Street) at South Burlington. Construction was underway north to Winooski and from Swanton to the Canadian border. Last exit signage along Interstate 89 northbound for U.S. 7. Note that the cardinal direction of SOUTH is displayed only, as the exit is the north end of the US highway. The village of Highgate Springs is three miles to the south. Photo taken 07/00. After leaving the port of entry facility on Interstate 89 northbound, traffic is greeted with this Quebec welcome sign. The divided highway of Quebec 133 only endures for three or so miles from the border. Photo taken by Dan Moraseski (09/14/02). First northbound Quebec 133 provincial shield. Fifty-five miles north of this location lies the cosmopolitan city of Montreal. The section of Quebec between here and the city of Montreal are generally flat lands. Photo taken by Dan Moraseski (09/14/02). After clearing customs, motorists see the first Interstate 89 sign bridge (bilingual) as the Interstate begins. A Vermont Welcome Center is situated between the port of entry and Exit 22/U.S. 7 south. Photo taken by Dan Moraseski (09/15/02). The overpass visible in the above photograph, is Pictured here. This bridge represents U.S. 7, as it loops from the west to the east over Interstate 89. The off-ramp for U.S. 7 south is just beyond this bridge, with the end seen in the next photograph. Photo taken by Dan Moraseski (09/15/02). The International Border marks the northern terminus of Interstate 89. This view taken from the U.S. 7 overpass takes a look at the port of entry. Photo taken 07/00. Interstate 89 replaced the original U.S. 7 routing into Canada. Now U.S. 7 loops around and ends facing south. This junction with a local road and ramps to Interstate 89 mark this terminus of U.S. 7. View here looks east at the first access to Interstate 89 from Vermont. Incidentally, there is access to Interstate 89 north on the other side of the freeway. Photo taken 07/00. The two-mile guide sign for Interstate 93, posted after the partial-cloverleaf interchange with New Hampshire 13 (Clinton Street). New Hampshire 13 and Interstate 93 serve interest to the greater Concord area. Photo taken 06/27/05. Pictured here are overheads for the final three exits of Interstate 89 southbound. Exit 1 departs the freeway ahead for Logging Hill Road south and South Street north. The community of Bow lies 2.5 miles to the south. Photo taken 06/27/05. The first warning of the impending end of southbound Interstate 89 is this set of caution signs, indicating that Interstate 89 ends in 3/4 of a mile. Photo taken by Joe Balsarotti (04/05). The end sign pictured above replaced this entry at one half mile out from the Interstate 89 end at Interstate 93. The freeway ends in an east-west fashion to the south of the state capital of Concord. Photo taken by Jeff Royston (12/02). Exit 1 comprises a folded-diamond interchange with Logging Hill Road ahead of the Interstate 89 half-cloverleaf interchange with Interstate 93. The panel indicates that Exit 1 is for local traffic only. South Street continues Logging Hill Road north into Concord itself. Photo taken 06/27/05. Southbound Interstate 89 at its southern terminus. This interchange also marks the northern terminus of the F.E. Everett Turnpike, as indicated with the toll designation on the Interstate 93 south panel. New Hampshire 3A parallels Interstate 93 to the east. Photo taken 06/27/05. Traffic continuing straight will directly connect with New Hampshire 3A/South Main Street. The northbound Interstate 93 panel includes shields for Interstate 393/U.S. 4 eastbound. The stem of Interstate 93 is only four miles to the north of this junction. The left lane connects directly to New Hampshire 3A and Hall Street. Photo taken by Joe Balsarotti (04/05). Exit 12S loops onto Massachusetts 3A (South Main Street) ahead of the Interstate 93 junction with Interstate 89. The half-cloverleaf interchange between the two freeways is unnumbered. Photo taken 06/27/05. An auxiliary lane forms between Exit 12 and the northbound beginning of Interstate 89. Interstate 89 represents the last exit before toll as Interstate 93 transitioned into the F.E. Everett Turnpike. Interstate 89 travels west eight miles to Hopkinton, providing a direct route to U.S. 202 & New Hampshire 9 west to Keene and Brattleboro, Vermont. Photo taken 06/27/05. Interstate 93 southbound at the northbound off-ramp to Interstate 89 north. 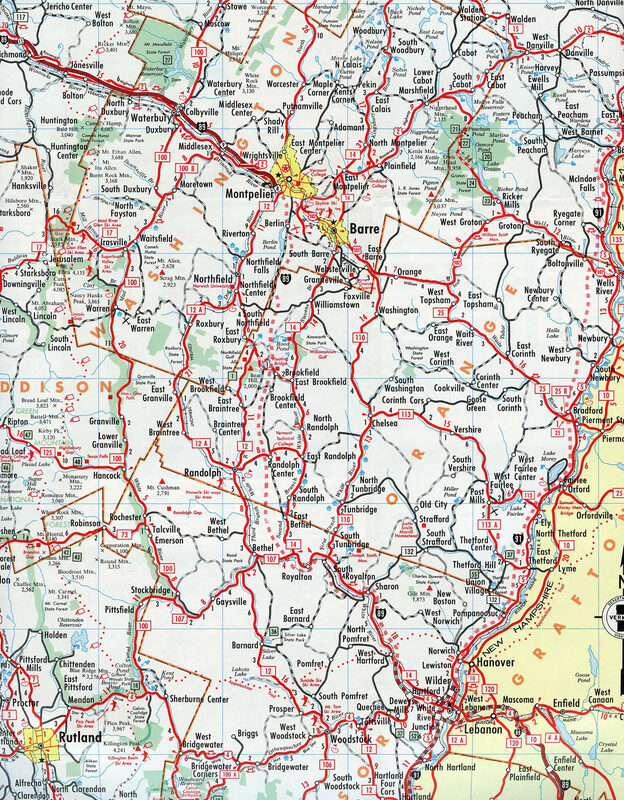 Interstate 89 ventures northwest 56 miles to Lebanon and 63 miles to Interstate 91 at White River Junction, Vermont. Photo taken 06/27/05. Interstate 93 (F.E. Everett Turnpike) travels 11 miles north from the merge with Interstate 293 to the southern terminus of Interstate 89. Pictured here is the 1.50-mile original sign panel for Interstate 89 north. The junction between the two freeways is not numbered. Photo taken 06/27/05. Three small Interstate 89 guide signs are posted along with the full-sized panels along Interstate 93 northbound. The shields feature a tall middle point on the Interstate shield, similar to signs used in Wisconsin. Photo taken by Joe Balsarotti (04/05). Interstate 89 northbound serves the Lake Sunapee Region at Exits 12 and 12A and Dartmouth College via New Hampshire 10 north to Hanover from Exit 1. Photo taken 06/27/05. Northbound Interstate 93 at the end of the F.E. Everett Turnpike and Interstate 89 and Grandview Road overpass. An non-reflective guide sign remains in use for Interstate 89, however the lighting fixtures were removed. Downtown Concord lies just over two miles to the north. The towns of Plymouth and Littleton are the next points of significance for Interstate 93 north. Photo taken 06/27/05. A lengthy collector distributor roadway facilitates the movements between Interstate 93 north and Interstate 89. The second small Interstate 89 guide sign resides at the gore point for the c/d roadway departure. Photo taken 06/27/05. An alternate route to Interstate 89 southbound is available via Exit 12S onto New Hampshire 3A (South Main Street) southbound. Massachusetts 3A intersects the end of the Interstate 89 freeway at Hall Street to the east. Photo taken 06/27/05. A loop ramp carries drivers onto northbound Interstate 89 toward Lebanon, White River Junction, Montpelier, and Burlington, Vermont. The c/d roadway returns to carry drivers onto Interstate 93 north from Interstate 89 south. Photo taken 06/27/05. Historical look at the Interstate 89 northbound loop ramp and guide sign posted on Interstate 93 northbound. Photo taken by Michael Summa (1977). “North Carolina Gains Names for Two New Interstate Designations.” North Carolina Department of Transportation, press release. May 25, 2016.